Belvedere Designs: It's a "Pin It To Win It" Giveaway! 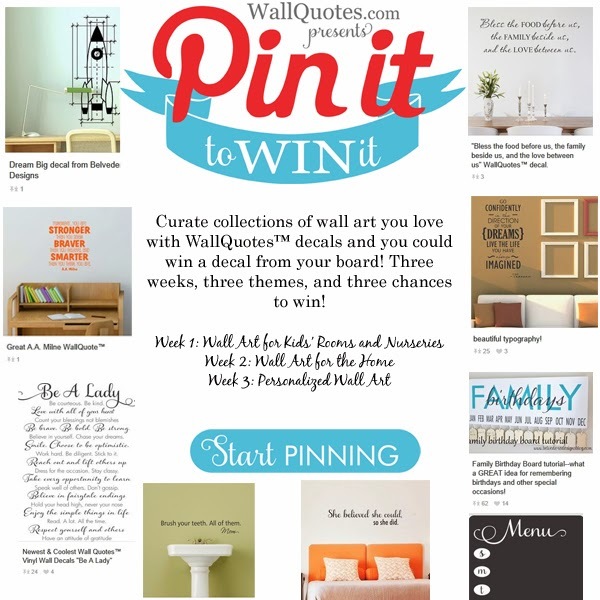 It's a "Pin It To Win It" Giveaway! We love Pinterest. Ok, let's be honest - we're a little bit addicted to it. You too? Then we've got the perfect thing for you - a Pin it to Win it contest going on now. And get this (the good news just keeps on comin') - there'll be three winners (one every week) and each will win one of the Wall Quotes™ decals they've pinned to their board. So friends - choose wisely. With three chances to win, you can enter just one week or all three. Each week features a different theme. Design your board to fit the theme and get pinnin'! 1. Be sure to follow us on Pinterest. 3. Submit your board on our Facebook page, and you're entered to win! While you're there, be sure to "like" us to stay up-to-date on new products, promotions and giveaways! What a bummer!! I missed the Pin It To Win It contest. I love to pin to my Pinterest Board and this would have been awesome. Well maybe next time.